This was my contribution to our Easter Sunday potluck breakfast at church. I saved this recipe from Cooking Light over a year ago, and have been eagerly awaiting a chance to make it. It was definitely worth the wait! I absolutely loved this! I’m a huge fan of grapefruit, so I was excited to see it in a baked good which is unusual. However, if you’re not a fan of grapefruit, I still think you’d like this cake. It has just the right amount of citrus flavor, but the sweetness of the cake balances it perfectly. My only complaint was that it was a bit crumbly, it definitely didn’t taste dry, but it didn’t hold together as much as I would have liked. Next time I’ll try using the full 8oz of cream cheese to see if that will help keep it together. Definitely don’t wait a year to make this, take advantage of the last of the grapefruit this season and make this! It’s perfect for a casual get together, or a light dessert (or breakfast). Preheat oven to 325°F. 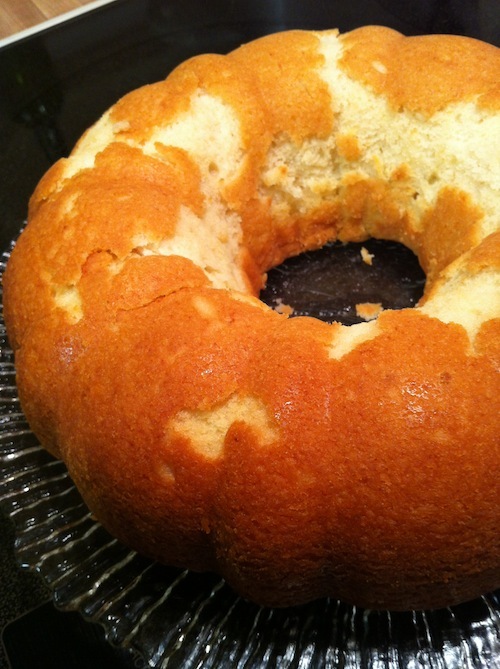 Grease a bundt pan generously with cooking spray. In a bowl, combine flour, baking powder, and salt and mix well. In a separate bowl, beat together sugar, butter and cream cheese until light and fluffy. Add eggs one at a time. Beat in oil, grapefruit zest and vanilla. Alternate beating in flour mixture and milk, ending with flour. Pour batter into prepared pan and bake for 55-60 minutes, or until a toothpick inserted in the middle comes out with a few moist crumbs clinging to it. Cool in pan for about 10 minutes, then turn cake out and allow to cool completely. You know how i feel about citrusy sweet carbs!